Submersible shredder pumps use a shredding mechanism plate to cut through stringy, fibrous or sludge type waste. Shredder pumps are typically used in sewage pumping station, sewage treatment plant, septic tank and water drainage applications. 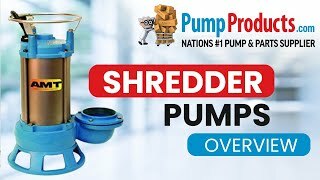 PumpProducts.com carries shredder pumps from AMT and BJM.